I have completed my B. Sc. And B. Pharma. I wanted to direct films and I had no access. Hence I have joined as production organizer in ETV’s Bengali channel and I used to work in Ramoji Film City. While I was the post-production in-charge for some serials, I learnt about editing. I have directed and edited a few Hindi serials as well. After that I have worked in direction department of Nagesh Kukunoor’s Hyderabad Blues 2. Then I have worked for Neelakanta’s Nandanavanam 120km and Mr. Medhavi. I have also done editing for Hindi film titled Brinda. I got hold of producer Pratap’s friend through a journalist from Andhra Jyothy. He was planning to make serials and I wanted to direct a film. He said that he will look into it. After a year, I got introduced to producer Pratap and narrated the story to him. He liked it and gave a go ahead. I gave him a budget figure, but the end product turned out to be 3 times more than what I budgeted for. We did a casting call through SMSs and facebook and got around 11000 applications. I had selected 26 fresh faces (11 girls and 15 boys) from them. We did a workshop for them for a couple of months. Since we are all new, we wanted good technicians. Hence we signed Sekhar Chandra (music) and Sriram (cinematography – Pilla Zamindar fame). Most of the people are interpreting 3G love as either 3rd Generation love or 3rd Grade love. 3G represents Girls, Guys and Greed. We explored how the current generation of youth is behaving regarding love. I personally feel that they are more mature than us and they can make a right choice for themselves. 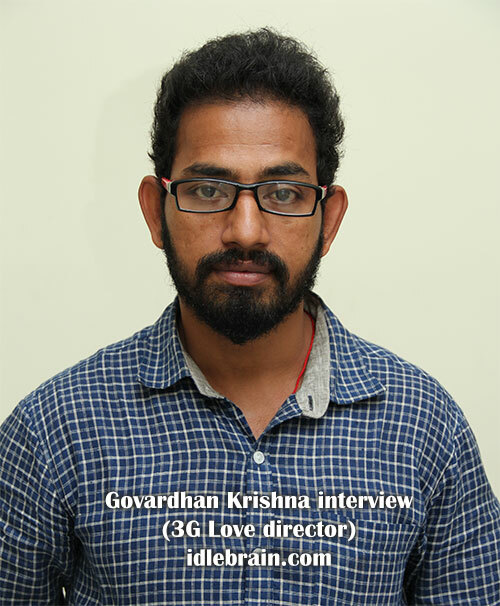 3G Love is a screenplay based script and there is no particular story in it. It has situation driven narration. Though it resembles the reality of current youth, there is a commercial feel to it. What’s your gut feel about movie? I request youth to watch this film with their boyfriend/girlfriend. Don’t watch 3G Love movie with your parents!